I’m a meat and potatoes girl through and through – I mean I love food period (well except healthy food, salads, “lite” etc…) but I can’t think of a meat and potato combo I don’t love. 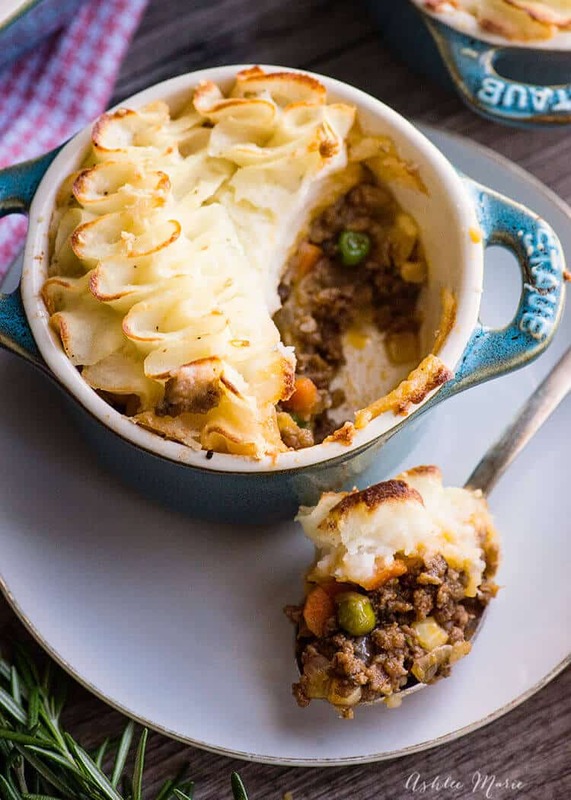 I’ll always be a happy camper with any meal that has these two items… SO putting the two together is an OBVIOUS choice – Shepherds pie (although you could also call it “cottage pie”) meat with some veggies and flavoring and topped with a creamy mash then baked – YUM! Now I say this a lot – but it should be said again – the best part about cooking from scratch is you can PERSONALIZE your food! 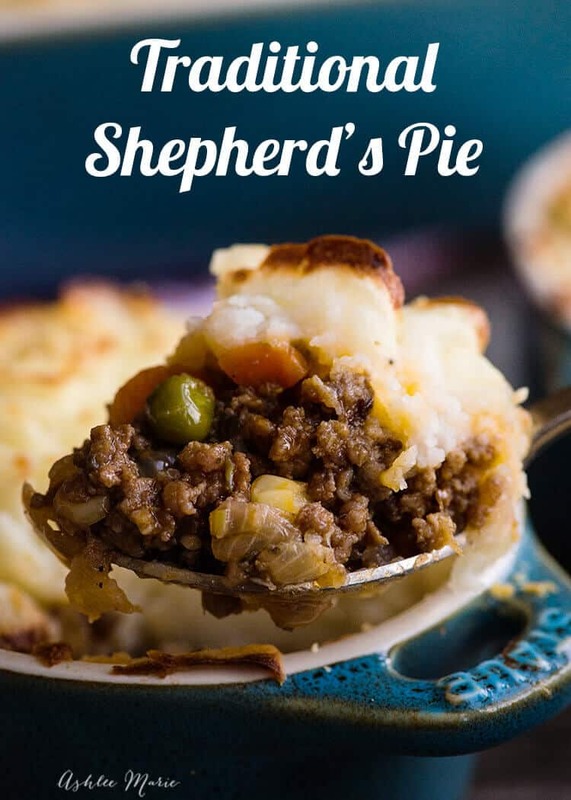 So while this is a great guide for a classic shepherds pie you can of course change it up a bit! I DID! I added corn in addition to the peas – not 100% traditional but something I enjoy! Kay let’s talk mash – 2 tricks – 1. 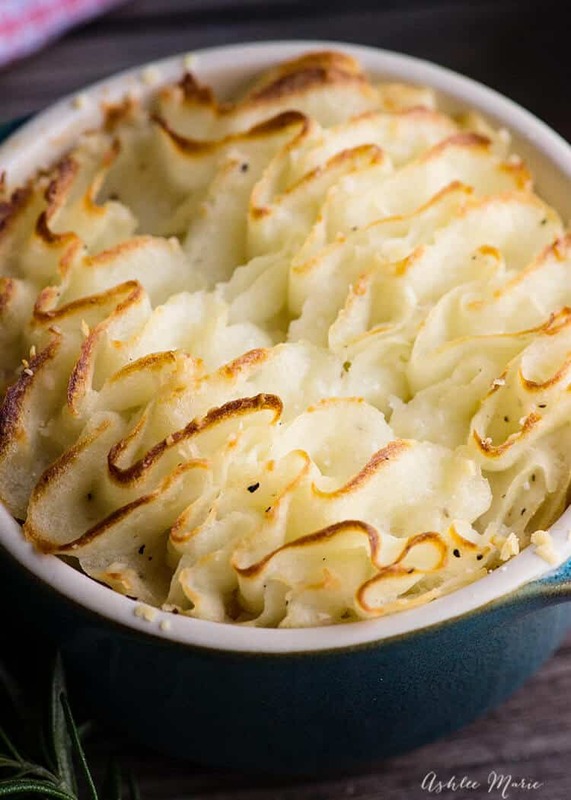 I used a potato ricer – you can mash these HOWEVER you like though – I just love the outcome of the ricer. and 2. adding FRESHLY grated parmesan to the potatoes – got this trick from Gordon Ramsey of course – and I have to say it’s DIVINE. 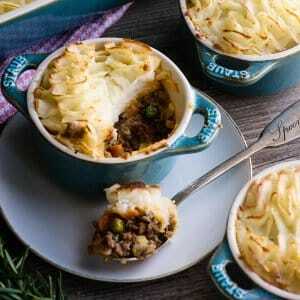 this shepherds pie is easy to make and tastes simply amazing. 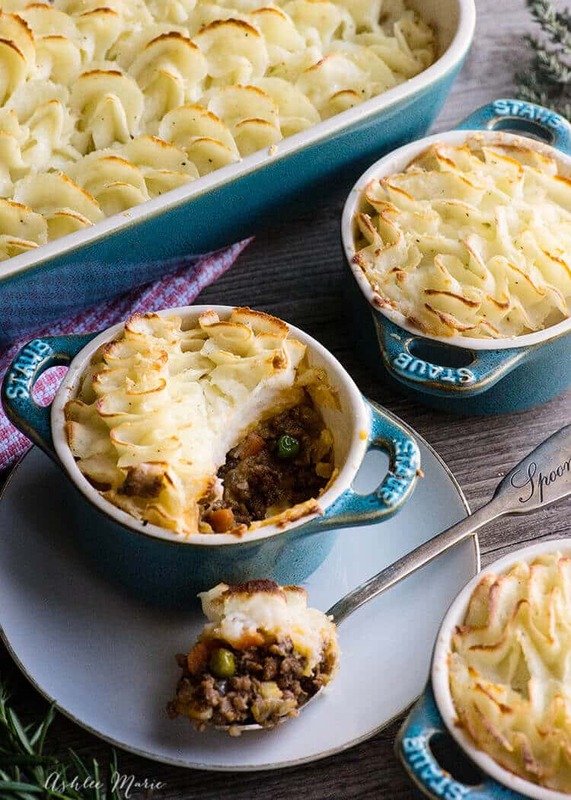 Shepherds pie means lamb while cottage pie means beef - so you can change the recipe easily depending on your tastes - the secret to the mashed potato topping is to use a ricer and add parmesean! add the fresh thyme and rosemary, salt and pepper, worcestershire sauce, tomato paste, beef broth and red wine. stir it and keep cooking until you cook down the liquid to almost nothing - it will still be moist but not wet. add on top of the of the meat mixture - you can pipe it on to be pretty like I did or just plop and spread - don't leave it perfectly smooth though, take a fork and mess it up so that it has texture. AND today is National PIE day! aka Pi Day! I ADORE pies, savory, sweet, quiche, tarts, all forms – This is one food holiday you don’t want to miss – it’s crazy fun – even my kids school is getting into it! We do all day pie! We’re doing Spinach artichoke quiche for breakfast, Shepherds pie for lunch, pot pie for dinner and sour cream lemon pie for dessert this year! 12 BRAND NEW pie recipes for pie day from Celebrating Food Bloggers! This looks amazing! I need to try this fantastic recipe soon! I’d love to make this recipe! When do you add the egg yolk to the mashed potatoes? I didn’t see it listed in the instructions. Glad you found me then! I’m all about rich decadent recipes! Where does the egg yolk come in? it’s optional for the potato topping, but it bothers most american so I took it out – forgot to take it out of the ingredient list.